This fabulously versatile non-woven fabric can be cut, sewn, painted, printed on, stenciled, stamped on, pleated, dyed, distressed, drawn on, die-cut, punched, sculpted, beaded, gel transferred onto, weaved on and more. The sheets are ultra-strong yet, easy to fold, cut, stitch, distress and embellish. Create delicate translucent effects with paints, inks, dyes and stamps. Sheets measure 8-1/2" x 11" and are available in 10-sheet packs. 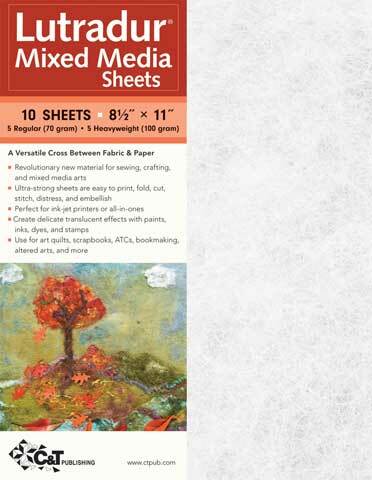 The Mixed Media pack contains five medium-weight 70gm sheets and five heavy-weight 100gm sheets. The Ultra-Light pack contains one 25 g sheet measuring 20" x 2 yards.